Were you disappointed when I posted a Thirsties review without a giveaway? Well, the kind folks at Thirsties are giving away the same items to one of you! 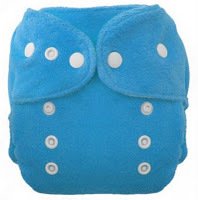 I would love one of you to add this trustworthy pair to your stash, or perhaps if you're new to cloth diapering this will give you a good start. One of you will win a a Fab Fitted and Duo Wrap (your choice color, size, closure)! Thank you for an amazing giveaway!